When you learn a new tune, what key of harp do you use? The key of the tune is just the beginning because the scale may not be the major scale. The first thing to figure out is the tune’s key. This may be written down somewhere. You may have to look at a piece of sheet music or a chord chart. Or you may have to just listen and try to identify the key note intuitively. What are the notes in the scale? If you have written music for a song, look at the very beginning of the tune to see the key signature, a group of sharps or flats clustered together at the beginning of each line. The key signature tells you which notes need to be played always sharp or always flat so that the scale has the right notes for the song’s key. Even if you don’t read music, you can deduce the key of the song from the key signature by comparing the number of sharps or flats with this chart. Each key signature can indicate either a major key or a minor key. Because these keys use the same key signature, they’re considered family. For instance, C major is the relative major of A minor, and A minor is the relative minor of C major. How can you tell whether the key signature indicates a minor or major key? Look at the beginning and ending chord names written above the piece. These are probably the tonic chord. If the opening and closing chords are minor, the tune is probably in the relative minor key. If the chords are major, the tune is probably in the relative major key. If the tune is in a major key, choose a key of harmonica that gives you first or second position, though sometimes you might also consider twelfth position. If the tune is in a minor key, choose a key of harmonica that’s in third or fourth position (or maybe fifth position) relative to the key of the tune. What are the notes in the chords? Say you’re having trouble choosing a harp for this chord chart. Find out the tune’s chord progression. The chords may be written above the notated music or printed lyrics or on a chord chart. 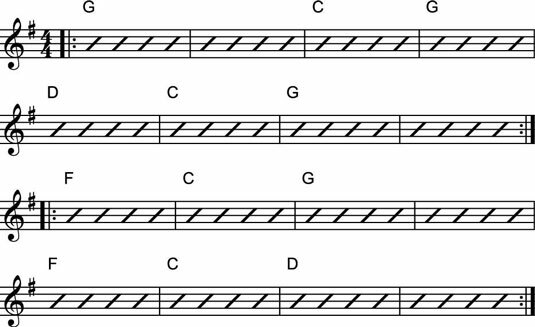 Figure out what notes are in each chord. You need to learn a little theory or look it up in a theory book or a book of guitar chords. Take all the notes of all the chords and put them in alphabetical order, like a scale. Find a harp that has that scale or one that’s very close to it. This scale almost matches the scales of a G-harmonica and a C-harmonica. The G-harp has F♯ but not F, and the C-harp has F but not F♯. At least now you know that the F chord and F note are causing the problems with the G harp. Where a note on the harp doesn’t fit, maybe you can bend a note to fit or just avoid that note. When you look at the available chords on the two harps, the G-harp has G and D chords and can outline the notes of C but not F. The C-harp has G and C chords and can outline the notes of F. It also has a D-minor chord (while the tune uses a D-major chord). If you look at the chord chart, though, the first chord is G, followed by C. Those chords are available on the C-harp, so maybe the C-harp is a better choice. Do the bent notes available on the harp help you match important notes in the scale or melody? If the notes that you need aren’t built into the harp, you may be able to create those notes by bending existing notes. Can you match most of the notes in the chords on one harp? If so, maybe you can leave out some of the notes. Are some chords more important than others? Some are just passing chords — chords that pass by quickly while helping one chord transition to another. You may be able to ignore these chords. Can you switch harps, playing one harp for one part of the tune and a different harp to match the chords in another part of the tune? Switching harps can be a great stage gimmick in addition to helping you out musically.